The mountains around Cahersiveen offer breathtaking scenery combined with peace, tranquillity for visitors and locals alike. Cúl Draíochta has been used as a base by many to explore Irelands most spectacular long distance walk, The Kerry way, over the years. The Beenatee loup and Valentia Island also offer superb walking opportunities. Maps and information available on request. "We only select the best accommodation for our walkers and at Cúl Draíochta B&B along the Kerry Way Trail we know they will find a friendly welcome and comfortable rooms. After a good night’s sleep, Ann prepares a hearty breakfast in the morning that keeps our walkers going through the day. For an enjoyable stay in Ireland, I have no hesitation in recommending Ann and the wonderful Cúl Draíochta B&B in Cahersiveen." 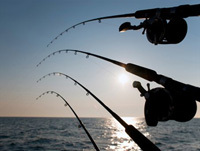 Cahersiveen is famous for deep sea angling and its waters are home to a wide variety of species. In 2001 and 2005 Cahersiveen hosted the European Deep Sea Angling Championships, attracting anglers from all over Europe. The local lakes and rivers are famous for wild salmon and trout fishing and there are many locations that provide the opportunity to fish from the rocks and beaches locally. 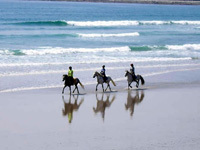 Local Equestrian centres provide trekking on the beach or through the countriside. Cúl draíochta is just 10 mins drive from the famous Waterville championship links course. Top golfers such as Tiger Woods and Mark O'Meara play here, and there is a memorial to the late Payne Stewart who was a regular visitor to the course. 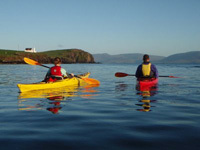 Excellent Canoeing, sailing and diving facilities. Tuition and hire available locally. Travelling at a leisurely pace allows you the freedom to stop and explore. Cúl Draíochta is located on the newly created Ring of Kerry cycle route. 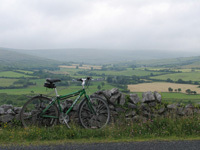 Bicycles can be hired nearby along with information on several local routes. Traditional music, ballads and sing songs - our pubs are renowned for their warm friendly atmosphere and great craic. There are several top class retaurants in the locality, some specialising in fresh seafood.